Right now is the time to stock up on nuts for holiday baking--and beyond! Kroger sells 8 oz bags of pecan pieces, 8 ounces for $2.99. $6 a pound is as cheap as I ever see pecans. Likewise, walnuts (which are almost always a cheaper alternative) are on sale for $3.29 a pound. All bags were stamped "good through October 2008". 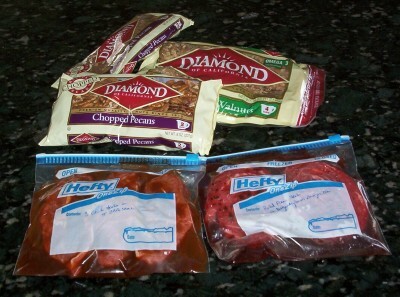 Freezing keeps nuts fresh even longer by preserving their oils. I am giving my husband's grandma a Bundt pan with four mini braided shapes. She always keeps loaves of nut bread in her freezer for breakfast and gifts. I bought two bags of nuts to go with her pan. A nice gift for under $10. By the way, if anyone knows a cheaper source for pecans, please share! I also found some flank steaks reduced-for-quick-sale. It's funny how expensive flank steaks have become! Look at any cookbook from the 1970's or earlier, and you'll always see flank steaks listed as the top budget beef choice. Now they cost $4.00 a pound, thanks to the 1980's low fat revolution. (Same with frozen orange roughy.) Chuck eye steaks are the more consistently affordable choice. Both need slow cooking and/or marinating for tenderness. Reduced-for-quick-sale meats must be cooked or frozen that day for safety. I didn't have time to cook them, so I slipped them in Ziplocs with leftover homemade vinaigrette as a marinade. Biblical Womanhood has lots more Frugal Friday posts for your perusal! Of course, it could all be location-dependent, but I found walnut halves-and-pieces for $3/lb at Kroger during last year's holiday sales. And I think Sam's Club had a lower price on pecans. Thank you--I was just coming back to edit after checking last year's price book. Pecans at my Sam's club were $6.50 a lb, so Kroger's deal is a good one. Walnut pieces, not halves, are at Aldi everyday for $3.29. Here, I was buying the type of nuts (whole, not pieces) and brand my husband's grandmother prefers. Just a reminder that nuts in general are at their lowest price point over the holiday season. I believe Costco had the best prices I ever found on pecans, but I'm no longer a member. I know flank steak is nuts. For most of my "flank steak" type recipes I use beef ribs now, cut up. Fatty, but flavorful. And usually the best deal in the meat department. I just bought a 2# bag of pecans at Costco for $9.99. Our commisary actually freezes the meat they reduce before the date. That's the first place I head when I shop and what's in the freezer dictates what we will eat for the next couple of weeks. Even though the meat is frozen I still hear people say they would NEVER buy the marked down meat, the idea is gross to them. I just nod and put my Porterhouse on the grill and smile when I hear them complain about how much they spend on their groceries. Great idea! Thanks for sharing it with us!! Holidays are a great time for deals on 'holiday' foods. I know last year I got TONS of pumpkin at give away prices after Thanksgiving. I'm hoping to do so again this year! Have a Happy Thanksgiving! The shelled pecans at Costco are very nice-- all halves from the bag I bought, at least. I always keep them in the freezer and just dip into the bag. Also, walnuts are higher this year than what I paid for them last year. Learn to identify pecan trees in older neighborhoods! There are hidden treasures for some small work in many places. Share the bounty with the homeowner, often older folks or a working couple who haven't ability or time to do it. This year is slim pickens in North Alabama, last year was GREAT! Pecans work that way.